SPEECH DELIVERED BY HIS EXCELLENCY, GODWIN OBASEKI AT THE EDO STATE POLICY DIALOGUE 8TH -10TH DECEMBER, 2016 AT RANDEKHI HOTEL, BENIN. Ladies and gentlemen, it is with a deep sense of humility and gratitude that I welcome you all to Benin today. The decision to bring some of the best minds Edo State has to offer to this forum is to assist us in forging a consensus on policies that would move us forward economically and deepen our democracy. That you are all here today validates my confidence in you and your commitment to our great State. For this, I thank you all. My informed estimation of your collective capacity for serious work, as gleaned from your previous achievements, informed your membership of this team. May I therefore implore you to passionately put all your intellect and energy into this task, so that we may jointly build a legacy worthy of celebration. Eight years ago, we began our critical engagement with The Edo Project. It was clear where we wanted to be in the index of functional states in Nigeria. In spite of the myriads of challenges, we succeeded in building a strong foundation for the take-off of the State. Now is the time to build on that foundation. Now is the time to engage great minds that would help build inclusive and enduring Institutions for Edo State. We need Institutions that would help unlock the ingenuity of our people to take advantage of our land and location, in creating an economically prosperous and socially stable Edo State. This would not happen by chance but by conscious and informed efforts of patriots. Before delving into the details of our expectations from you, let me share with you, certain nations and cities that have fascinated and intrigued me in my several years of engagement with the issues of Institutions and policies in the making of prosperous nations and states. North Korea and South Korea. In 1945 after the end of the Second World War, Korea, which was previously under the colonial control of Japan, was divided at the 38th parallel into two spheres of influence. The South was administered by the United States of America while the North was administered by Russia. These two countries that were similar in all material respect before 1945 are today two completely different countries, Economically. South Korea is today one of the miracle economies of East Asia but North Korea is mostly in the news for famines and political repression. Today, there is a tenfold difference in the quality of living between both nations. Another classical case of how the choice of institutions and policies can ruin or make nations, states , cities and even villages is the case of Nogales; a border town between Mexico and USA , described in the book ‘’Why Nations Fail’’ by Daron Acemoglu and James Robinson. Ladies and gentlemen, the difference in the economies mentioned above is not in the genetics, religiosity or ethnicities of the people. The difference is in the politics that produces the right leadership by a progressive elite, ready to pay the price in attaining greatness for nation and happiness for all. The difference, is in the presence or absence of inclusive institutions capable of inspiring progressive competition among citizens, in such a way as to create an economic revolution that benefits those willing to work without sacrificing lofty ideal of a socially responsive state where Justice, Fairness and Freedom in pursuit of truth is sustained. Let me be very clear about where we want to be in Three years; The Most prosperous economy in South- South, Nigeria. In Seven to Ten years, we will be the Number one economy in Nigeria. In 15-20 years we want to be the No.1 investment destination in Africa. To achieve our Vision for Edo, we must build world class institutions capable of nurturing and implementing transformational policies. We must deliver on infrastructure better than the best available in the Federal Capital Territory. We must aim at generating more revenue than Lagos State without putting an unbearable tax burden on the people. We must therefore focus on developing and motivating our human resource in such a manner as to prepare them to deliver on scale never before witnessed in Edo State. When posterity comes to judge us, let history embrace us for being ambitious in Our Visioning, but let it not be said that we were Lilliputians when our economic realities demanded giant ideas and great innovation. If we consciously aim for the sky, we would certainly jump above the ceilings set by our fears and the past. · Strategies for encouraging the creation of more SMEs and how to make them sustainable catalyst for Economic Growth. · Sustainable Environmental management in the face of Global warming. 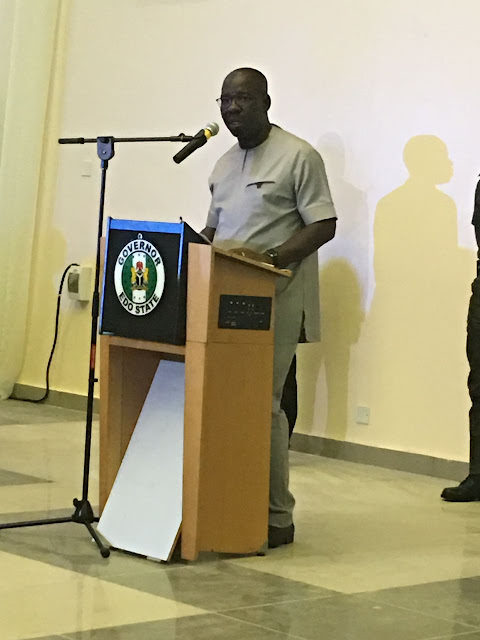 As you continue with this onerous task of helping Edo to chart a way forward, I would like to assure you that we would do all within our powers to make your job easier. More importantly be assured of our willingness to implement your recommendations.